When Nancy Churnin was writing her children’s book about William Hoy, the deaf Major League Baseball Player who had a significant impact on the sport in the early 20th century, her mind kept returning to the deaf and hearing-impaired students at Stonewall Jackson Elementary. 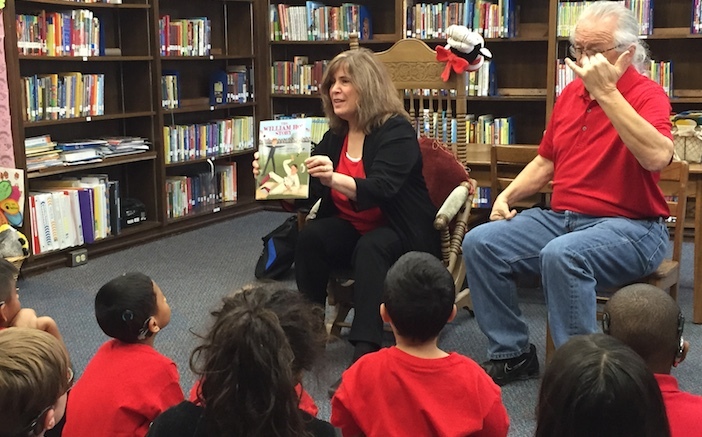 Churnin, who is also the theatre critic for the Dallas Morning News, kicked off her school book tour on Friday by reading the The William Hoy Story to the deaf and hearing-impaired students at Stonewall Jackson Elementary. As a translator signed out everything Churnin said, the students intently followed the story of how Hoy overcame adversity and succeeded as an MLB player. Stonewall Jackson Principal Melanie Schiff said she enjoyed seeing how much the students got out of the story. To learn more about Hoy and what inspired Churnin to write the book, click here to read a Q&A she did with the Dallas Morning News.